The Hero Thrill Show made its debut in 1954. 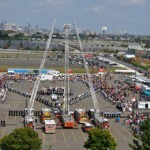 The mission of the Hero Thrill Show is to raise money to pay for the college tuition of children of Philadelphia Police Officers and/or Firefighters killed in the line of duty. 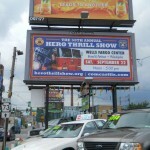 Until 1990 the Hero Thrill Show was produced by the City of Philadelphia. 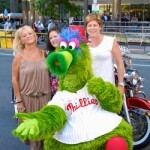 After the 2005 Hero Thrill Show the Hero Scholarship Fund discontinued the show. 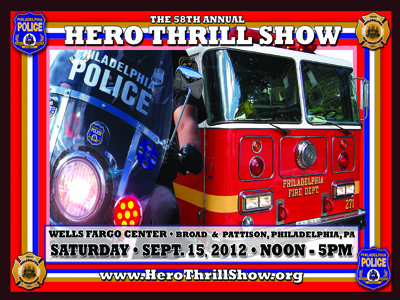 The Hero Thrill Show Kick-Off Press Conference was September 5, 2012 at Noon in front of 1818 Market Street, Philadelphia PA and included performances by the Highway Patrol Motorcycle Drill Team and the Bicycle Stunt Team. The event attracted some 40,000 people to the Wells Fargo Parking lot with the hopes of raising $400,000 to pay the college education costs of fallen police and firefighters. 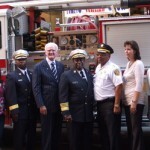 James Binns is committed to honoring badge-wearing heroes throughout the year. 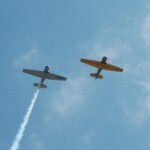 He launched a program placing memorial plaques at sites where heroes lost their lives. He’s on a personal crusade to secure new motorcycles to replace aging units. And when he’s not promoting the Hero Thrill Show, he’s working other programs like the Weight Watchers-funded Battle of the Badges weight-loss competition to raise funds to help families. Four new families will benefit from this year’s fundraiser. Police officers Brian Lorenzo and Moses Walker and firefighters Daniel Sweeney and Robert Neary were killed in the line of duty. 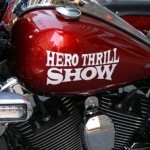 Please show your support and follow the Hero Thrill Show facebook page.